The Good Bowl is a game changer for those messy little noshers we like to call our pets. It is an all-in-one mat with bowls that captures your pet’s mess. What else? The mat suctions to any flat surface, making it difficult for paws (and tiny toddler hands) to tip over. 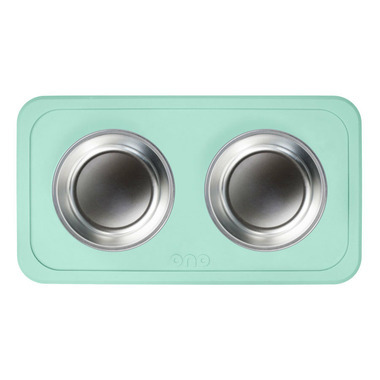 All Ono mats come with the mat plus two removable stainless steel bowls, which makes for easy refills and cleaning. Your mat will look brand new meal after meal and wash after wash, as silicone doesn’t fade or deteriorate. What's more, the mat is made from 100% food-grade silicone that is BPA, BPS, PVC and phthalate free. Dimensions: includes two 16 oz stainless steel bowls 5.5" diameter/each. Mat measures 18" x 10" x 1.6"
Best pet bowl system ever! Have had ours for at least 6 months. Still looks as new as when we bought it. Highly recommend. We use for our 2 cats.